Hello everyone, I’m Joanna from Quirky by Design, but all my friends call me Jo, so please, just Jo. I’m so excited to share some beginner tips on starting dip pen calligraphy and hopefully infect you with an appetite and enthusiasm for this art form. Whilst I always say that at the end of the day, a calligrapher’s favorite nibs are a subject of personal preference, there are quite a few that I’d recommend for beginners. Nikko / Zebra G – A popular nib for beginners, the G nibs are not too stiff or too soft / flexible, thus resulting in greater control when you’re just starting out. Hunt 22 – A slightly softer nib in comparison to the G nibs, the Hunt 22 is a great choice if you’d like a little flex in your nibs without losing control. Hunt 101 & Leonardt Principal – This is a very flexible nib, with a sharp point. The flexibility of the nib results in thick, luscious down strokes (also known as shades), and the sharp point results in fine hairlines. This creates a beautiful contrast between your thick and thin strokes. I have a penchant for vintage nibs, mainly because it feels surreal to be using nibs that are no longer in production, like writing with a little part of history. Blanzy 2552 – Beautiful sharp tip that doesn’t drag or snag on your paper, yet soft enough to create beautiful contrasts between your thin and thick strokes. Henry 605 – This one has an odd shape, but I love that it holds a ton of ink, meaning you don’t have to keep dipping your nib in ink, freeing up more time for you to concentrate on your strokes and flourishes. Before you actually start using your nibs you need to prepare them by taking of the oil coating that is applied by the manufacturer. You see, the nib manufacturers apply a protective layer on the nib in order to prevent them from rusting, and before you can start using them you need to remove this oily coating. This step is essential because if you don’t do it, the ink wont stay on the nib and it will be very hard (if not impossible) to use them. Luckily this process is quite simple, it only takes a few minutes and needs to be done only once. Apply a bit of tooth paste on your tooth brush and gently scrub the nib (both sides) for about 30 seconds. Be sure to scrub it gently in order to not damage the nib. With the help of a cotton swab rub some alcohol/acetone on the nib. Once you have cleaned the whole nib you are ready to use it. 3. Stick it in a potato! Yups! good old fashioned potato does the trick when it comes to nib preparation. All you need to do is grab a fresh potato and slowly (very gently) slide the nib inside of it – don’t stick the whole thing in otherwise it will be hard to pull it out. Don’t hold it more than 10-15 minutes otherwise your nib might start to rust. Once you are done, simply dry it off and you are all set. 2. the oblique pen holder. Whilst the oblique holder is admittedly more suited for right handers, there are now also oblique pen holders for left handers. The oblique holder holds your nib at a set angle, making it easier on your neck and shoulders when you’re writing for long durations of time. make sure you have a comfortable chair and desk at the right height for writing. I’d say, save those extra dollars for writing tools. ⦁ They come in blank sheets, lined and with dot grids. My favourite for beginners are the lined pads. When it comes to ink, you really have a wide choice. Not all ink are the same, some are too thick while others too liquid. Luckily you can always thicken the ink with gum arabic and dilute it with water if needed. This will require some trial and error before finding the right combination – as it also depends on the nib and the paper you use. How do I hold an oblique pen holder ? Probably one of the questions I get asked most, the oblique pen holder looks tricky, but you basically hold it like you would a regular pen or pencil. One point to observe is that when observing the pen from its side, the nib should be at a less inclined angle as the body of the holder, as this prevents the nib from snagging on your paper on the upstrokes. By aligning the point of your nib to the slant lines, you allow the nib tines (the two sides) to open up equally – thus giving you that nice thick down stroke. In order to achieve this you will have to rotate the paper your are writing on – instead of bending your arm in a unnatural position. How do I get started writing calligraphy ? It is always recommended that you use proper guidelines when starting out. This ensures that you develop the right muscle memory. The diagram below refers to both the anatomy of calligraphy type in accordance to the baseline, cap height, ascender and descender, as labelled. I like to think of calligraphy as a composite of different basic strokes. Underturn – start by applying pressure on your nib on the down stroke, slowly curving upstrokes and releasing pressure as you do that. Overturn – the opposite of the underturn, start with an upstroke, curving downwards and applying pressure for a thicker down stroke. Ovals – when drawing out oval strokes, I imagine the face of a clock, and start going counter clockwise from ‘1 o clock’ making sure that the stroke is balanced on both sides. Compound Stroke – a combination of the overturn and underturn, start as if you’re writing an overturn, and connect that to the underturn after your down stroke. upstroke, and cross over to end with a thicker down stroke. Descender – this stroke is used for letters such as ‘ g, j, y, and z’. Start with a thick down stroke, crossing over to end with a thin delicate upstroke loop. Now that you know the basic strokes, it’s time to combine them to form letterforms, or alphabets. It’s easier to approach calligraphy when you break down each alphabet into the basic strokes that they’re composed of. For instance, the letter ‘a’ is made up of an oval and an underturn. Refer to the attached sample guide sheet for a quick example and rundown of how to write the letters ‘a, d, g’ and ‘n, and m’. Below are some examples of dip pen calligraphy letters. Try and identify the basic strokes that make up each letter, and reconstruct the letters based on the basic strokes they’re composed of. 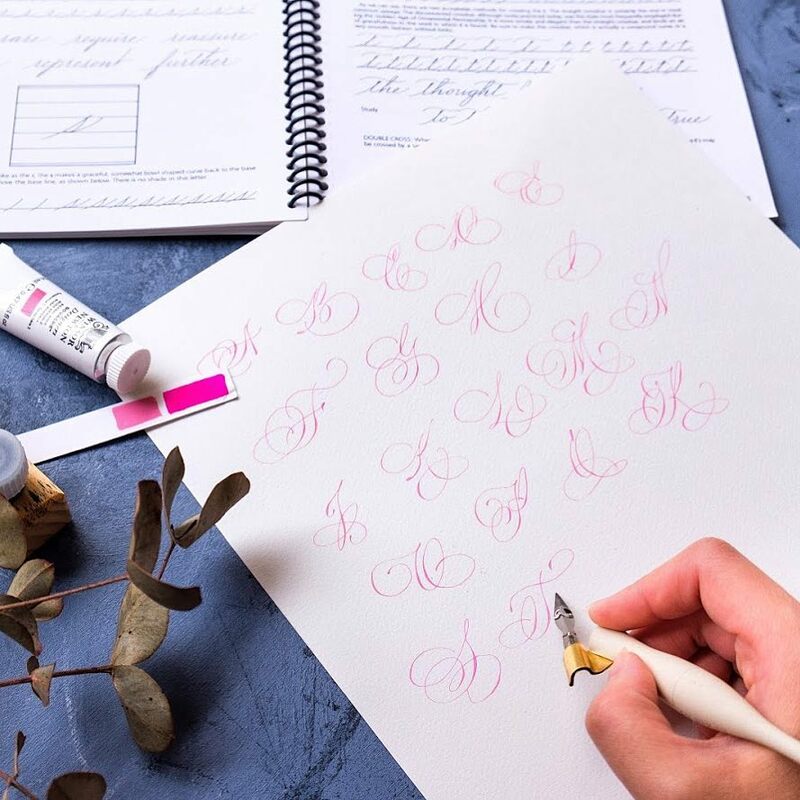 We’ve prepared some free downloadable practice sheets that will help you practice the basic calligraphy strokes as well as blank sheets with guidelines that will keep your letter forms nice and consistent. Drop your email below so we can send you over the practice sheets. The internet is a rich resource for materials pertaining to calligraphy. Here are a few of my favorite places for resources, ranging from tools to free articles dating back to the 18th century. IAMPETH.com – the International Association for Master Penmen and Teachers of Handwriting is a wonderful site that is a treasure trove for free articles pertaining to traditional calligraphy. meet Master Penmen and other calligraphy enthusiasts. The Postman Knocks – a pretty equipped website for modern calligraphy, covering tutorials and more. John Neal booksellers – one of my favorite places to get tools, they stock everything from papers, inks , nibs to hand turned pen holders and calligraphy books. Calligraphy is a process and a journey. I’ve been doing it full time for almost four year now, but still find myself learning something new everyday, therefore I think that an essential ingredient in what makes a great calligrapher is the enthusiasm to keep learning and keep on practicing. Set aside 10-15 minutes each day for intentional practice. Intentional practice means paying close attention to your letterforms, and studying each one intently before moving on to the next. I like to practice with quotes and poems to practice long form writing, and I think writing out the lyrics of your favourite songs can be an interesting way to keep on practicing. 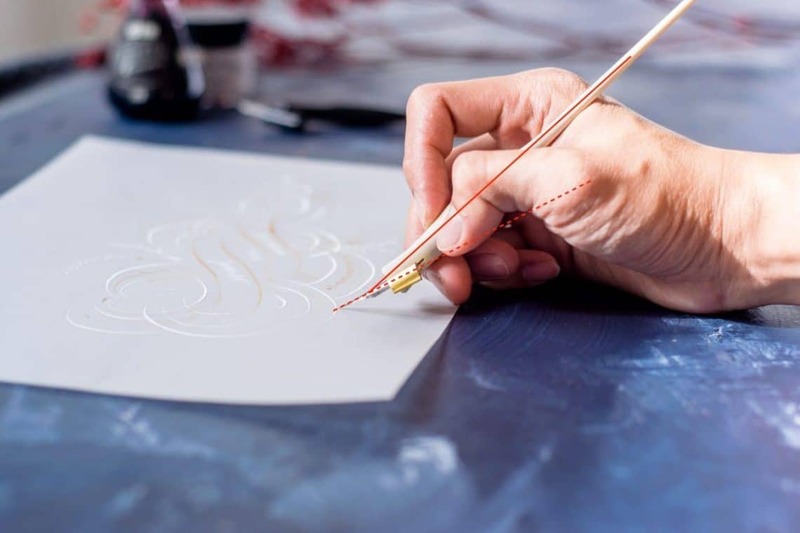 Whilst calligraphy is just enjoying a resurgence in popular interest, the art form has been around for centuries. Thus, one of the best resources to refer to is the work of the old masters of the craft. Thankfully for us, there are tons of resources available, both in printed form and on the world wide web. Whilst it is great to refer to these works for reference, it is imperative that you keep on honing your skills and learning the right letterforms before coming up with your own take on flourishes and variations to the alphabet. Have fun. After all that has been said and done, remember to always have fun. Personally, I find it very therapeutic and relaxing to unwind at the end of the day whilst practicing some letterform variations or referring to old journals and articles regarding penmanship. I’m always amazed at the amount of creativity and dedication that was put into the simple art of translating thoughts into tangible letters, and presenting it in a way that is ageless. of putting pen on paper, and watching ink scribble out beautiful letterforms that has graced everything from official documents to intimate love letters. I am not sure, but i think that if you reach out to Joanna directly she will be more than happy to provide additional info. This article you have written, was so informative, I absolutely loved it. I’m wondering if you have a online course?